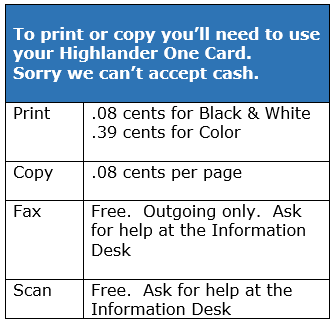 Note: You can deposit cash onto your card at the library. The machines do not make change. Need to print a poster? Here's how it works. It's free and the paper is provided. Paper size is 36" wide and you decide the length. Ask one of the technicians at the Circulation Desk to get you started. It prints slowly and there might be others queued up so plan accordingly. With Mobile Print, you will be able to email in the document you want to print from any device. After that, you will be able to print to Library Printer 3. To register and use Pharos Mobile Print, you must first follow the easy steps below. Note: You can currently only use this service from on campus, while on the MCC network. Select an email account that you wish to use in order to send documents to print from. Open a new email and send a blank message from your email account to the following email address: pharos@students.mclennan.edu. No subject is needed. Soon after you send the email, check your inbox for a reply. Just follow the directions in the reply email and click on the supplied link to register that email address. When you click on the link, your web browser will open and take you to the Pharos MobilePrint web page. Note: You can currently only get to this web page from on campus, while on the MCC network. Log on to the site using your MCC College account (your portal user name). Make sure you only enter in your user name, and not your entire email address (leave off the @students.mclennan.edu part). After you successfully log in for the first time, check your email inbox again before proceeding. You will have received an email asking to confirm your email address. Follow the directions and click on the link provided to confirm your email. Next, another browser window will open asking you to confirm. Click on Confirm. This will associate your email address with your MCC account. After you click on Confirm, you will be redirected back to the MCC MobilePrint web page. Now you are ready to use the MobilePrint service. Going forward, you will only need to come to this page when you would like to manage your registered emails or manually upload documents to print from a Pharos Release Station on campus. Once your email addresses have been registered, they will be associated with your MCC College account, and you will be able to email documents from any of them to be printed from an MCC Pharos Release Station on campus. Now, you can either upload your documents manually from the MCC MobilePrint web page while on campus, or email your document as an attachment from anywhere. Emailing your document as an attachment is the preferred method, and the fastest way to process your documents for print. Going forward, after you email in your document to be processed you will receive an email when your document is ready to print. Simply follow the directions in the email, and go to Printer r#3 on campus to print your document.